Maria Sharapova had her first win at Melbourne Park since claiming the 2008 Australian Open title, beating Thai veteran Tamarine Tanasugarn 6-1, 6-3 on Monday in the opening match on center court. The former No. 1-ranked Sharapova, who missed the 2009 Australian Open with a shoulder injury and was ousted in the first-round last year by fellow Russian Maria Kirilenko, struggled with her serve and was inconsistent in the second set. 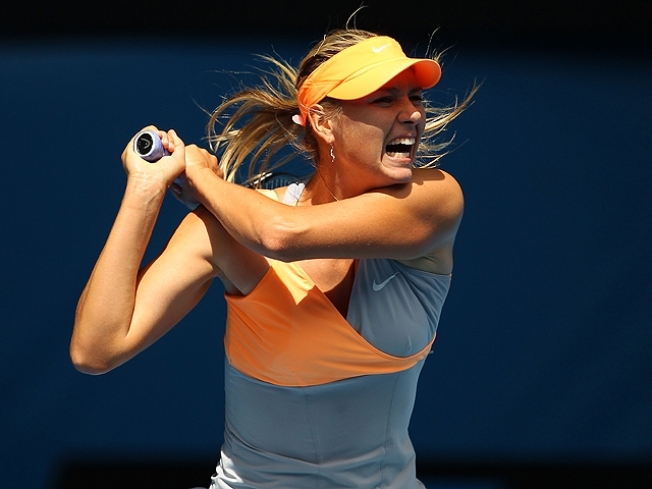 After losing the opening service game at love, Sharapova won seven straight games to take a 1-0 lead in the second set. The 33-year-old Tamarine, clearly not in peak physical condition, rallied and had a game point on serve for a 4-1 lead but Sharapova broke back and regained momentum, winning the last five games. Even when she was winning, though, Sharapova had trouble finding range with her serve. She had 10 double-faults and five aces. Nerves had a role in that. "I definitely felt that in the beginning. I knew I had an early exit last year and didn't want that to happen this year," said Sharapova, who has the goal in Australia of "staying aggressive and little by little trying to get my game better, maybe to where it was a few years ago and maybe better than that." In the other women's first-round matches, Russia's Evgeniya Rodina beat Australian wild card entry Olive Rogowska 6-3, 6-1. Julien Benneteau of France withdrew from the Open before his first-round match because of an infected finger on his right hand. The 29-year-old Benneteau, a right-hander, was scheduled to play 26th-seeded Juan Monaco of Argentina. His spot in the draw was given to lucky loser Simon Greul of Germany. Defending champion Roger Federer was to play Lukas Lacko of Slovakia in the third match on Rod Laver Arena, where he has won four previous Australian titles. He and top-ranked Rafael Nadal were behaving like best mates on Rod Laver Arena - high-fiving, hugging, shaking hands and laughing at each other's jokes on Sunday night in the exhibition "Rally for Relief" fundraiser for victims of the fatal floods in Australia's northeastern Queensland state. It'll be a completely different story if they're back on the same court in two weeks. Nadal has won the three Grand Slam titles since Federer won here in Australia and is aiming to become the first man since Laver in 1969 to win four straight majors. It's being dubbed the "Rafa Slam." At their exhibition Sunday, Federer said Nadal has "been playing incredible." "An incredible run through the French, Wimbledon, U.S. Open - it was incredible to see. Then obviously it's hard to maintain. But he's going to be for sure ready for this," Federer said. "I'll follow it very closely. If I get a chance, I hope I can stop him." Also on the first day, No. 1-ranked Wozniacki takes on Gisela Dulko of Argentina. Third-seeded Djokovic, the 2008 champion, plays Spaniard Marcel Granollers in the main night match Monday. Andy Roddick plays Jan Hajek of the Czech Republic on the second showcourt. Following Roddick on Hisense Arena will be fourth-seeded Venus Williams against Italy's Sara Errani, and seven-time Grand Slam winner Justine Henin against Indian qualifier Sania Mirza. With Serena Williams unable to defend her title because of her injured foot, Clijsters is considered a favorite for the women's title at Melbourne Park.